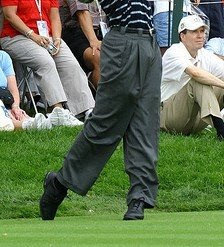 Tiger’s Left Knee in action. IN A TELEPHONE INTERVIEW, Tiger’s Left Knee updated ARMCHAIR GOLF on the most ballyhooed golf comeback since Ben Hogan limped to the first tee at Riviera in the 1950 Los Angeles Open. Q: Thanks for taking a few minutes. It’s good to have you back. LEFT KNEE: Sure. It’s good to be here. Q: Straight up, what can you tell us about Tiger? Q: LK! Are you reading this? LEFT KNEE: Sure. It’s all good. Q: Why the statement? We’ve always kept it real in the past. LEFT KNEE: I’ve got to keep things inside the camp. You know, I can’t say too much. It’s not the way we operate. Look at Stevie. Q: Can we talk about you? LEFT KNEE: What do you want to know? LEFT KNEE: I’m feeling good, overall. Rosey [Dr. Thomas Rosenberg] says everything looks real solid. LEFT KNEE: Not really. I have some stiffness. But after sitting around for weeks, that’s expected. We’ve also been working out pretty hard lately. Q: Lee Trevino said Tiger needs to change his swing, that he can’t continue to swing so hard with you locked. LEFT KNEE: If I got a buck for every time someone had swing advice for Tiger over the years, I could bail out the economy by myself (laughing). Q: So you’re not concerned? LEFT KNEE: We played hurt for years and now I’m reconstructed. I’m ready to go. Q: How about the motivation? Are you ready for tournament golf? LEFT KNEE: I watched Follow the Sun, Hogan’s comeback movie, about 20 times during the layoff. Cried every time. One time I woke the baby. Elin didn’t like that. Anyway, believe me, I’m inspired. Hogan’s mangled legs showed incredible courage, and I intend to follow in their footsteps. Um, so to speak. Q: What do you know about Brendan Jones? LEFT KNEE: He’s No. 64 in the world. We always open up against No. 64, if you know what I mean. Q: I do. Thanks for taking the time, and good luck this week. You forgot to ask left knee about the Golf Channel 'countdown to the return of Tiger' that is omnipresent in the upper right corner of their screen. Geesh. Did I sense some clenched teeth on a few of his answers? See he's toughing it out for Mr. Woods. I'm telling you, Mr. Woods pushed him to come back early so Mr. Barkley wouldn't get so much of the spotlight with "The Haney Project." I know jealousy when I see it. Remember I was a figure skater! Its so exciting having tiger re-emerge in this match play event. It will be interesting to see how he plays on 2 good knees.I know he's been practicing for awhile on good knees but I'm sure he's ready to get back to his winning ways. Even more interesting will be watching how the play of Vijay & Phil and everyone else is effected. Will they rise to the occassion or slump their shoulders in defeat. Go Tiger! I feel bad for the right knee with the left getting all the attention this week. You could almost hear the right knee wincing as the flash bulbs went off . . . Exciting to have both of them (the knees) back on the fairway. Hey, all, thanks for the comments. Interesting, several people have mentioned the lack of attention the right knee gets. It makes me wonder if there's any resentment in the Tiger knee camp. Very funny bro. . .